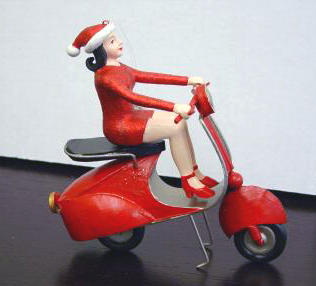 And a Scootery Christmas to all . . . Saw these cute little santa-ettes on eBay but unfortunately I can’t find them on the web anywhere. If you know where these can be found, would you let us know? The girl figurine is scaled to be an ornament or a tabletop piece and the other is a stocking holder/hook. There’s probably more in this line out there. But where oh where? 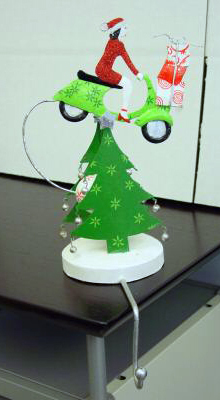 This entry was posted in Holiday, Models, Figurines by Tracy. Bookmark the permalink. I’ve searched eBay and can’t find this at all? Any idea who the seller was?